Dartmouth College supports American veterans. 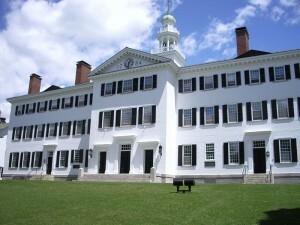 Dartmouth College is a leader in recruiting veterans of our nation’s military to matriculate to the College on the Hill. Former Dartmouth president James Wright, himself a former United States Marine, made recruiting members of our military a priority under his administration and the university has continued this very admirable work since his retirement. As quoted in an article in “The Dartmouth” recently, “Former College President James Wright, who joined the Marines at age 17, has continued to actively support the College’s veteran community and has been critical to recruitment. ‘My objective has been to encourage these injured service men and women to go on to school,’ Wright said. What a wonderful ambassador Wright remains for Dartmouth. And why shouldn’t a highly selective college like Dartmouth recruit members of our military? Top colleges are looking to form diverse classes of talented students with interesting stories and life experiences. Those who represent the red, white, and blue have those in spades. Certainly more than a kid who plays soccer and dabbles in Key Club — wouldn’t you say? As quoted in “The Dartmouth,” “‘They’ve seen more and experienced more of the world, and I think that helps students that are 18 to 22 gain some perspective on the things they’re struggling with today,’ [Dean of Admissions and Financial Aid Maria] Laskaris said. ‘My hope is that our veterans can provide important mentorship and examples of working through perhaps greater challenges than the vast majority of our current students have ever faced in their lives. '” Well said indeed! Ivy Coach, over the years, has worked with many members of our military on a pro bono basis, helping them gain admission to the colleges of their dreams. It’s work we very much enjoy as helping these young men and women who have served our nation achieve their dreams is one of the very best feelings. We salute Dartmouth College for leading the way among the highly selective colleges in recruiting American vets.